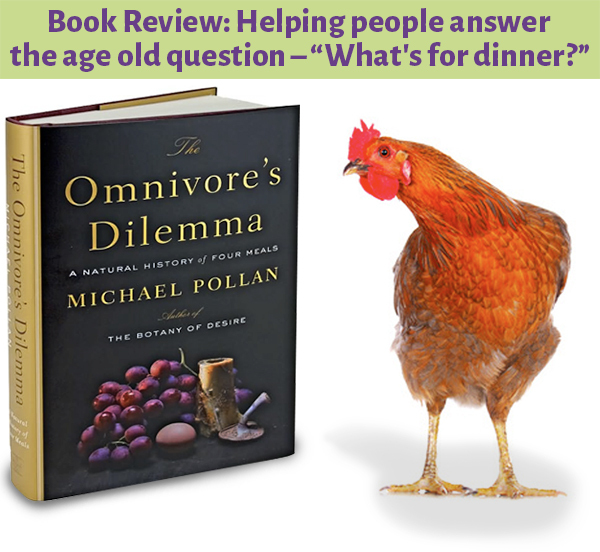 I recently finished reading The Omnivore’s Dilemma by Michael Pollan — what an interesting, in-depth book! The term “omnivore’s dilemma” refers to the question of what to eat, when virtually every food known to man is at your fingertips. Should you go gluten-free? Vegetarian or vegan? Pescatarian? How about low-carb, Paleo, dairy-free, or sugar-free? Is it better to drink kale smoothies every morning or eat a traditional foods breakfast? How can we feel our best, perform well, maintain a healthy weight, and feel satisfied at the end of the day? Specialized eaters like the koala do not need to think at all about what to eat. They see eucalyptus, they eat it. Humans, on the other hand, have to devote quite a bit of brain power to the question of What’s for dinner? Anthropologists believe this dilemma is a key reason that humans have such large and sophisticated brains. Centuries of wisdom and cultural knowledge passed down from our ancestors have always given us guidance in eating choices — until now. The omnivore’s dilemma has returned to haunt us, in what Pollan calls a “national eating disorder.” Without the single stable food culture many other countries enjoy, Americans are at a complete loss as to what to eat. The Ominvore’s Dilemma is split up into three parts. Part one details the industrial food chain, following corn from farm to table (or, in this case, farm to car, following a fast-food stop). Part two discusses the pastoral food chain — alternative or organic agriculture, both local and worldwide. Part three is dedicated to the neo-Paleolithic food chain, exploring that which is hunted, gathered, and grown. Michael Pollan defines industrial food as that which requires expert help (from a nutritionist, for example) to decode its source or nature. And when we take a closer look at the true nature of industrial food, we find that most of it traces back to a single source: corn, grown in the American Corn Belt. Nearly a quarter of items at the supermarket contain corn in its various forms — high fructose corn syrup, corn starch, corn oil, citric acid, MSG, xanthan gum, plus meat, fish, dairy, and eggs all derived from animals fed primarily or solely corn. This cheap corn in cheap food comes at a price. Pollan traveled to a family farm in Iowa, and discovered that while the farm grows enough food to feed 129 people, it is barely staying afloat financially. In fact, the farm is mostly supported by a federal subsidy and the farmer’s wife’s salary for her work at a social services agency. Furthermore, this farmer can’t even feed his own family with what he grows, because none of it can be eaten as is. Instead, his corn must be fed to livestock or processed. This is a hallmark of the industrial food chain: heavily subsidized cheap food with little ability to truly nourish people. For most of history, corn needed to be grown alternately with other crops, and the fields spread with manure. This ensured each crop of corn would have sufficient nitrogen to grow. The advent of chemical fertilizers in the late 1940’s, when the war was over and the American government was left with a surplus of the ammonium nitrate used to make explosives, is what allowed hybrid corn to proliferate. This also led to monocultures, since there was no longer a need to rotate crops or use cover crops to keep the land fertile. Corn could be grown in the same field year after year, and there was no need to farm animals for their manure. Now, instead of converting sunlight to food, fossil fuels are used to create synthetic nitrogen fertilizers, power tractors, and fuel the trucks and machines used to transport and process the corn. An acre of corn requires a minimum of fifty gallons of oil. CAFOs (confined animal feeding operations) can buy commodity corn for less than it costs a farmer to grow it. Feeding animals corn has made meat less expensive and more readily available. However, the animals suffer in deplorable conditions, and a feedlot cow may require an estimated 35 gallons or more of oil, in the form of commodity corn number 2, over its lifetime. Synthetic nitrogen fertilizers are detrimental to our health and our environment. During planting season, the excess chemical fertilizers enter downstream water supplies and make public drinking water unsafe and even deadly to young children. The fertilizers also pollute the oceans and poison marine life. Pollan notes, “By fertilizing the world, we alter the planet’s composition of species and shrink its biodiversity. Corn and soy are heavily processed and broken down into barely-recognizable components that no longer resemble whole foods. But, according to Pollan, “When fake sugars and fake fats are joined by fake starches, the food industry will have at long last overcome the dilemma of the fixed stomach: whole meals you can eat as often or as much as you like, since this food will leave no trace.” The food industry is no longer confined to the natural limits of human consumption, and can expand faster than the human population. Furthermore, once portions were supersized, people began eating a lot more in one meal. Evolutionarily, this makes sense; hunter-gatherers feasted on large portions, anticipating future famine. Now, with food abundant and always available, our feasting just packs on pounds, and three out of every five Americans is overweight. We are predisposed to prefer fats and sugars, since these are the most concentrated sources of energy (calories), but now we are presented with unnatural concentration of sugar and fats in processed foods. Choosing these processed foods does serve an economic purpose, though; a dollar can buy nearly 1200 calories of potato chips but only 250 calories of carrots. Michael’s corn journey culminated in a McDonald’s meal that bore little resemblance to any of its ingredients. He asked a biologist to analyze a McDonald’s meal using mass spectrometry, and found that the soda was 100% corn, while the nuggets and cheeseburger we 56% and 52% corn, respectively. Sadly, 90% of corn’s energy is lost during processing, essentially wasting calories that could have fed the hungry. Next, Pollan followed both the industrial organic food chain and the pastoral food chain. The industrial organic food chain is eye opening, and in many cases turns out to be much more similar to conventional industrial farms than pastoral organic farms. Food is one of the only products marketed only by price, notes Pollan. In most store flyers, generic pictures accompany simple ads such as “Apples 99¢/lb” or “Chicken $1.99/lb.” There are no details like where the fruit was grown or who farmed the chicken. Walk into any Whole Foods, by contrast, and you are bombarded by flowery language and confusing terminology: “Eggs from cage-free vegetarian hens,” or “Milk from cows that live free from unnecessary fear and distress,” or “Sustainably farmed free-range chicken,” along with pictures of quaint farms and pastures. This is one of the “key innovations” of organic food says Pollan, this shift to passing on more information to the consumer. The effect, though, is often dizzying — and misleading. Most of the organic produce at Whole Foods comes from either Earthbound Farm or Grimmway Farms (Cal-Organic), both large California-based companies, because buying from small farms is no longer practical. Much organic milk comes from factory farms, and you can even buy “organic” microwavable TV dinners synthesized from xanthan gum and soy lecithin. General Mills now owns Cascadian Farms, who produces some of these organic TV dinners. This is not what Pollan found in most of the farms he toured. He visited chickens at an organic farm that “live lives little different from any other industrial chicken,” and “free-range” means that there is a little door leading to a patch of grass that the chickens never step foot on, since it is only left open for about 2 weeks before the chickens are slaughtered. He saw acres of farm where “organic” simply meant “no chemical fertilizers” and natural fertilizers were trucked in from many miles away. As the term “organic” was defined and refined, it came to include “organic” dairy from cows that never see a pasture and “organic” processed foods that contain synthetic chemicals. While organic dairy cows are supposed to have “access to pasture,” that term is vague enough to be, in effect, completely meaningless. The founder of Cascadian Farms, Gene Kahn, did start his business more in line with the organic ideal. However, he soon found he could make more money buying produce from other farms and processing it, than by growing produce himself. It is hard for large-scale farmers to reach the organic ideal of a complete, self-contained, biodiverse ecosystem. Although small farms often come closer to the ideal and are even more productive acre-for-acre than their large-scale counterparts, they cannot keep up with demand for large quantities of a single vegetable that national grocery chains require to stay stocked. Grocery stores want a consistent, large amount of produce from a single supplier — they do not want to deal with many small farmers with varying quantities and prices. This is not to say that large organic farms are doing little good. The Goodmans, who started Earthbound Farm, estimate that taking over 25,000 acres of conventional farm land and growing organic on it has eliminated 270,000 pounds of pesticides and 8 million pounds of chemical fertilizers. They also power their tractors with biodiesel. They do, however, need to rely on a conventional supply chain to keep prices down. Ecologist David Pimental estimates that the entire process of growing, harvesting, cleaning, packing, transporting, and shelving lettuce at the store takes over 4600 calories of fossil fuel energy for an 80-calorie bag of organic lettuce — hardly an energy-efficient process. Is Organic Food Healthier and Tastier? Without nitrogen fertilizers, organic goods grow more slowly and “develop thicker cell walls and take up less water” than conventional goods, so they stay fresher longer. Organic produce may be tastier, too, as in the case of organic tomatoes, which have more sugars (and less water) and thus more flavor than their conventional counterparts. Organic food may even be more nutritious, recent studies suggest. Pollan points out that just like we can’t substitute nitrogen fertilizers for manure without causing an imbalance, we can’t presume to know what nutrition in organic produce is yet to be discovered — for example, polyphenols, which are not present in fortified processed foods. But is organic always better? Pollan’s industrial organic meal comes from Whole Foods, most of it Cal-Organic (under Grimmway Farms). Grimmway makes it clear that they are only in the organic business for profits, and do not believe conventional farming is harmful in any way. Even organic produce is shipped from all over the country and the world, and the food industry consumes as much petroleum as cars do. “Today it takes between 7 and 10 calories of fossil fuel energy to deliver one calorie of food to an American plate.” Growing organic food requires a third less fossil fuel than conventional, but only if compost is produced at or nearby the farm. Later, Pollan visits a self-proclaimed “grass farmer.” This pastoral farmer, who uses solar energy, diversified crops, chickens to spread manure as fertilizer and eliminate parasites, and grassy pastures to feed cows, is not technically organic. He calls himself “beyond organic,” and has little use for the regulations governing industrial organic farms. Grass is “the way we capture solar energy.” When cows eat at pasture, they spread their manure just where it is needed, and there is no waste — and no waste in efforts, either. All the farmer has to do is rotate his cattle. The pastures are left with a great biodiversity and thousands of pounds of carbon is removed from the atmosphere. Converting 16 million acres of cow-feed corn to grassy pastures would remove 14 billion pounds of carbon from the Earth’s atmosphere annually: an amount equal to taking 4 million cars off the road. Polyface, the small, family owned grass farm, does not sell to supermarkets or ship long distances. This is in direct contradiction to the typical food item in an American’s meal, which has traveled over 1500 miles. Instead, Polyface sells at local shops, restaurants, and farmers’ markets. The meal Pollan cooks following his experience at Polyface is comprised of locally farmed chicken and produce. Pastured food is more nutritious; the fats in grassfed meat and dairy healthier and higher in omega-3. Everyone at the table for this meal felt it tastier — the chicken more “chickeny,” the corn more flavorful. This small scale farmer came much closer to reaching Howard’s organic ideal. The final meal Pollan wanted to explore was one made entirely from food he had hunted, gathered, or grown himself. He had never fired a gun, and had a fear of gathering mushrooms, but he wanted to create and eat a meal in which he was completely aware of every aspect of it. There is no longer enough wild game and plants to feed us all, should we all attempt to return to hunting and gathering, so this was not a meal meant to be a guide for others’ to follow. He simply wanted to be fully conscious of the killing, gathering, and interconnectedness of species. Humans are designed to be omnivores: our teeth and jaws work well on both animals and plants, and our stomachs produce an enzyme to break down elastin, which is found only in meat. We require vitamins that can only come from plants, like vitamin C, and others that can only come from animal products, like B12. However, the need for variety coupled with the access to choices brings us much anxiety. Many cultures have food traditions and habits that successfully handle the omnivore’s dilemma, but the US does not. For centuries there have been rituals around the slaughter of animals, but most Americans do not follow these kind of rituals and we are far removed from animal deaths. Pollan postulates that the way to come to terms with eating meat is consciously killing and eating on a personal level, and transparency in the CAFOs, where the reality would prove too grim, so we’d eat less meat but the animals we do eat would be treated properly and humanely if everyone was witness to how they live and die. Nevertheless, we prefer the detached uninvolvement of factory farming, rather than the engaged, even enjoyable, hunt. Indeed, Pollan’s hunted pig left him with a curious combination of pride, disgust, shame, and gratitude. Pollan’s final meal was dubbed “The Perfect Meal.” He grew his own wild yeast for the bread, used dried mushrooms he had learned to gather himself, cooked the pig he had shot, and supplemented with various fruits and veggies he had grown or gathered locally. He even tried harvesting salt, but pollution at the salt flat and a lack of knowledge about purification methods led him to abandon that idea. Finding the foods he wanted was challenging, for aside from fruits, which want to be eaten in order to spread seed, everything edible in the forest is hidden. Pollan needed to rely heavily on others with more experience. He found that the hunter/gatherer knowledge he seeked was not easily learned in books — he required personal interaction with, for example, those who had eaten wild mushrooms and survived to tell about it. Perhaps this is the exact interaction that is missing from our American culture. We pass on recipes and eating quirks, but rarely do we pass on a food culture, a wealth of information and knowledge about what foods are safe and dangerous, or teach the skills needed to hunt, or gather, or grow our own food. And so every day we are once again confronted with the same problem: What exactly should we eat for dinner?